On one occasion I attended one of those Book Club/Meet the Author sessions where everyone reads a particular book in advance and then meets up to discuss it with the author, who also reads extracts from it. It taught me two things. The first was that, even where we all share a common language and come from largely similar cultural backgrounds, our responses to what we read are remarkably diverse. A book I had read as a joyful celebration of the fundamental goodness of humanity, others saw as a commentary on the oppression of women, on the failure of Christianity to engage in modern society and as an indictment on the entire democratic system. Characters I had seen as peripheral to the basic thrust of the story were regarded by others as significant, plot lines which I had felt drove the book along were regarded by others as distractions to the main thrust of the author’s argument and references to time and place which I had felt to be irrelevant clouded the entire perception of others. The author, sometimes puzzled by lines of questioning and at other times apparently taken aback by the perceptiveness of his readers, gave every impression of accepting different opinions of his motives while acknowledging more than once that he “had not thought of it in that light”. The second thing this meeting taught me was that authors are not always the best readers of their own work. Beyond this occasion, I have heard poets on the radio deliver their lines in a totally impersonal and unconvincing manner, as well as authors stumble awkwardly over their own syntax. Simply put, once the job of creation is done, the author’s involvement in the work is finished and the work is only enriched by subsequent interpretations made from a range of personal standpoints. From what I can gather, that seems a pretty widespread view in the literary arts. So why is it not the same in music? There is, of course, one basic difference. Unlike in literature, where the consumer (in this case the reader) is the interpreter, in music, because the language is inaccessible to the majority of consumers, the interpreter effectively adds a middle layer to the process. Perhaps we can best see the role of the interpreter in music (the performer) as akin to that of a translator, bound by the original text, but free to communicate it in a way perceived to be most readily accessible to the consumer. Certainly there is no parallel in the arts for the creator to be the ideal interpreter? It is historically interesting to hear old recordings of, say, Rachmaninov performing his own music or Elgar directing his own scores, but does it in any way help us understand the music better? I fervently believe that one of the things which makes art (or classical) music so infinitely rewarding to the listener is the very multi-layered path between creation and consumption. By allowing the composer to perform his own music, we are missing out on a whole world of nuances introduced by the various interpreters of the original truth. Which begs the question; Is there any artistic value in a composer performing his own music on disc? A lot of them do it and, I have to admit, in many cases if the composer were not to record his own music, nobody else would. There are instances where composers perform music which is neither published nor available to any other performer, while some use the CD to promote their music by suggesting that, if we like what we hear, we can purchase a download of the music from the composer’s own website. Beyond that, however, some established composers devote much of their life to performing their own music on disc. 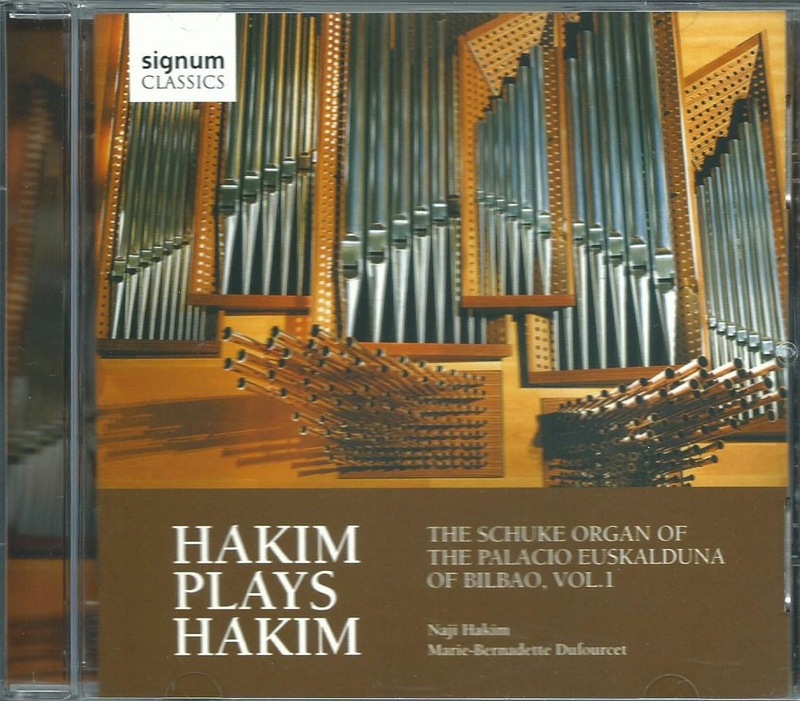 Sent for review this week has been just such a disc, bearing the title “Hakim plays Hakim” and featuring some seven recent works by the Lebanese/Parisian organist/composer Naji Hakim. (Strangely, this is the third disc released on the Signum Classics label so entitled, yet this third one bears the suffix “Vol.1”. Never mind; I’m sure there’s a logical explanation.) My personal collection includes 14 CDs containing music by Hakim and performed by different organists, and I doubt there is anyone even loosely connected with the world of organ music who would argue that Hakim’s music is not of the very finest quality and deserving of interpretation by a wide variety of organists. Naji Hakim is a brilliant organist, and his performances of music by others reveal an intense and searching interpretative mind supported by a superb technique. But when it comes to his own music, I find his performances create a barrier rather than open a door to his musical intentions. That barrier is part psychological; does he record it so much because he feels he cannot trust others to interpret it? If so, surely that diminishes the artistic value of his music. But it is also part physical; he is such a brilliant player that it is difficult to imagine anyone else performing his music so well, which rather negates the value of those who do. I am very exercised in these thoughts because, were it anyone else playing these works, I would find fault in what sounds often like poorly controlled articulation and a tendency to let speed override technical constraints. In some of the passagework, I detect uneven rhythmic articulation and smudgy detail; and were it any other player I would not be afraid to suggest this. But because it is the composer, we tend to assume this is what he intended and, therefore, we cannot criticise the performance without implicitly criticising the music which, despite the fact that this disc inhabits an undiluted territory of fast and jolly music, I would not wish to do. How better it would have been to hear someone else play this music so that we could the more easily distinguish between compositional weakness and performance weakness. It strikes me Hakim is in danger of over-exposing himself on two fronts, and the result might be to diminish his stature on both. Among my favourite historical recordings are several of Rachmaninov performing his own music. But when I heard a young player attempt to emulate the lurching rubato and heart-stopping pauses the composer added to his playing (but not to his written-out scores), I was horrified and said so; to which the young pianist replied; “I was only doing what the composer himself did, and surely he knows what he wanted and we cannot argue with that?” We can argue with it. When it comes to performing their own music, composers no longer have exclusive interpretative rights and we should regard their performances as no more legitimate than anyone else’s.